In other words, students should only alter but should not modify the school uniform. Following a thorough review, we have found that the suggestions provided in the following article are consistent with the above clauses. Nonetheless, readers should bear these clauses in mind when reading the article. When in doubt, readers are advised to consult the COC. Readers may direct all queries to members of the School Discipline Committee. The RI uniform is, admittedly, not very recognisable. An RI boy could easily be mistaken for a student from SJI or St. Patrick’s School; besides, recognition comes from familiarity. This can hardly be cultivated when the only public appearances RI kids make are from home to school…and back. Regardless, how you wear your uniform is an important matter, if not so much outside of school, then in it. On the scale of importance, we would place it between ‘It’s not fun being late for morning assembly’ and ‘Should I get food from the RI (Year 1–4) canteen today?’ – it usually doesn’t cause any official trouble to your person, but can affect your mood and how people perceive you. 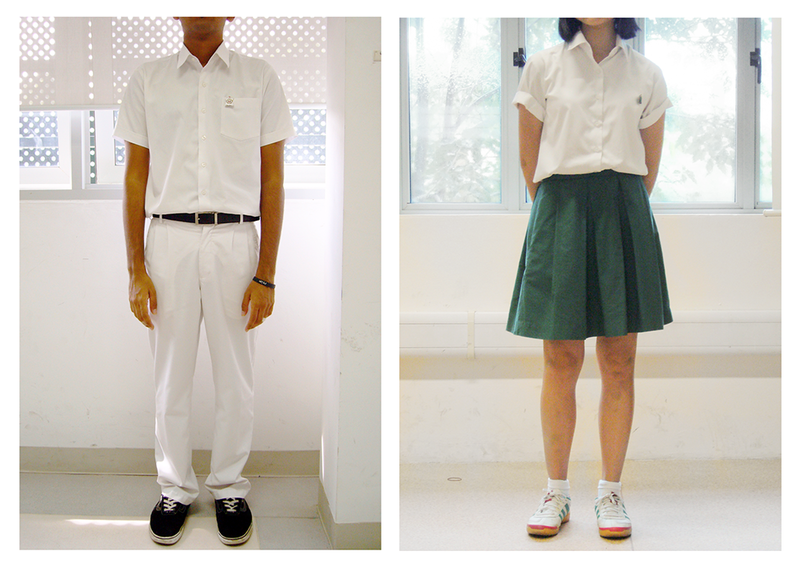 Most of us quickly learn what to wear and how to wear it within the first few months of school (particularly the RI boys) but to speed up the process, here is a short guide to the evergreen combination of the white shirt with a pair of pants or a skirt. #1 When do I have to buy it? Year 5s are required to start wearing the RI uniform rather late into the term, in about April or so – due notice should be given by the school. But if you know you’re going to need it, why not buy it, well, now? In fact, the ideal time to drop by Bibi & Baba (#02-28, Far East Shopping Centre) is the month of November, before the PSLE results and consequent school postings are released. Following that, you will have to jostle with all the terrifying little twelve-year-olds who got into ACS, RGS, MGS, and so on…and their parents. However, if the excitement of going to Far East Shopping Centre and getting a brand new uniform seems like too much for you, you can hang around in your secondary school clothes until Bibi & Baba comes by the school to sell their wares, usually during the second week of term 1. This could, though, be risky, since the popular sizes (e.g. the size M skirt) usually run out fairly quickly. #2 What should I buy? Full school uniform (shirt + skirt/pants) is worn throughout the week, but students can choose to wear the Team Raffles shirt (a black dri-fit polo shirt, obtained through CCAs) instead of their blouse every Wednesday. PE is twice a week, but students are not allowed to wear the PE shirt during morning assembly. If you are a girl, you should get 1–5 green skirts, 3–6 white blouses, 1–2 PE shirts, and 1–3 pairs of PE shorts (Raffles shorts from the school bookshop, or regular black shorts from wherever). Boys should be looking at at least 2 of the following: white pants, the white shirt, the PE shirt, and PE shorts (also from the school bookshop/elsewhere). The exact amount of each item is a personal decision, dependent on your family’s laundry schedule, your hygiene standards, frequency of use, and considering the cost. Blouses, skirts, and pants fall within the range of $10–$25, so bring a little over $100 with you when you get your uniform. You should also acquire a couple of school badges from the school bookshop. Accessorise, accessorise! (And if you must remove one item before leaving the house, don’t let it be your badge.) Few people buy ties in Year 5: one is rarely necessary, and when it is, it is usually along with the formal uniform – which can be loaned, tie and all, from the Student Affairs Centre. RI boys have the choice of sticking with their secondary school uniform (perfectly fine) or ‘upgrading’ to the Year 5-6 version, which has minor cosmetic differences such as pleats on the back and sleeves of the shirt and on the pants. In addition, the pants are a bit baggier and the cuts for the shirt are bigger for the same size (so make sure you try it on), but that may vary based on the supplier. Most opt for replacing their older sets either because they are already about two-years-dirty, or because wearing the new ones make them feel more grown-up (they do!). #3 Why does it look so…strange? When it comes to the boys, tailoring is more of an option than a recommendation. Most people don’t really care, but for the more self-conscious, read on. For many, the new pants are often too long and baggy for their waist size. While this may be the ‘look’ desired by the school, given that most RI boys have rather thin legs, it has the potential to look slightly clownish on some. Alteration services usually go for about $8–$12 per pair of pants. We recommend that, at the very least, you should shorten your trousers if they’re too long, so that you don’t have to roll the hems up. You can ask the tailor to narrow the legs as well, with the options ‘straight-cut’ (recommended) or ‘tapered’, which is supposed to make the pants look like skinny jeans. Don’t overdo it or you’ll look like a poser, or, worse, get reprimanded by a teacher (though many seem to get away with it anyway). Another thing to keep in mind for those who are going to overdo it anyway: there is a tendency for pants (in general) to ride up when you sit down, especially so for tapered ones, which tighten treacherously around your thighs and nether regions. Remember the denim in skinny jeans is both stronger and more elastic (and hence more rip-proof) than the cloth of our RI pants. It is generally not advisable to wear a green jacket if you are a girl. For boys, a simple black or dark brown belt (no ‘fancy’ prints) is optional, but highly recommended. Shoes should be either mostly white or mostly black, with matching laces, while socks should be white. 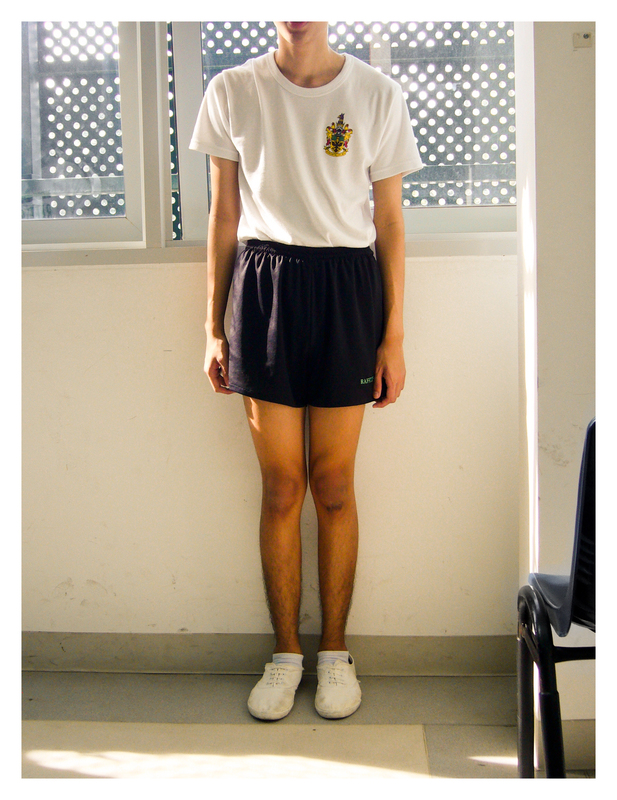 And beware: Mr Tan Boon Poh (Assistant Department Head/Discipline) will be reminding you in the first week of school that violators of the dress code will be issued Warning Slips and asked to leave campus. If you have any questions, are in need of style advice, or want to ask if a pair of shoes will be allowed, leave a comment below and we’ll try to get back to you! Otherwise, tell us what else you’d like to hear about in our Platform Gap survey. See you in two weeks! Bibi & Baba is located at Far East Shopping Centre, not Far East Plaza. ← Read our previous guide to subject combinations here. For our Diary of an RI Intern column, we interview Miranda Yeo, a J3 who interned at the Straits Times Newsdesk from March to June 2012. We find out whether her initial interest in journalism persisted after a challenging yet enriching internship, where she had a Hougang resident set his dogs on her while requesting for an interview! She recounts how the eight times a story she wrote didn’t eventually make the paper were “veritable stab(s) to the heart”, and how her initial ideas about “boring old Singapore” were disputed as she met interesting and diverse strangers on the job. What is the predicted probability that a pair of standard Year 5-6 pants will catch fire in the course of two years’ wear? Also, does Griffles wear anything at all under those shorts? i think.. 1-3 skirts will be more than enough. you don’t need so many skirts in your life and that many blouses because the uniform can be pricey and getting too many is such a waste of money. Seriously, save the money. it’s only 2 years. Why is it not advisable to wear a green jacket? My senior wears one and she I think looks good in it. What shades of green are you advising against? I thought socks of any colour were allowed. How about hair accessories? What colors are they generally allowed in? Also for shoes are high-tops considered legal? hi may i ask if black shoes with yellow laces and base are allowed? Raffles look great ! As for boy’s uniform has closely mistakem for st Joseph institution.We hope to distinguish Raffles in their special way..
Can we just wear back our RGS blouse? No you can’t. The RGS blouse is very transparent, it was never designed to be worn alone. So you wear it as a RJ blouse, and it’s a sunny day and you perspire a little, everything turns see-through. The RJ blouse is much thicker, and has a pleat at the back. The RGS blouse has no such pleat. Are ankle socks allowed with white canvas shoes?